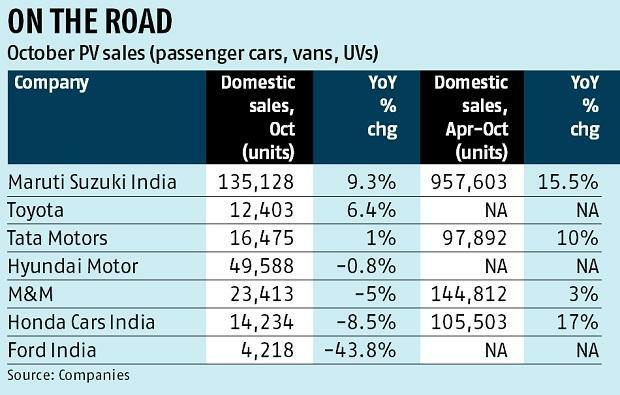 While the festive cheer had boosted passenger vehicle (PV) sales in September, the Diwali month of October saw muted growth on high base effect seen a year ago. Numbers from automobile majors suggest rather flat growth this month compared to October 2016, which was defined by both Dussehra and Diwali falling in the same month. The country’s largest carmaker, Maruti Suzuki India Ltd (MSIL), posted a 9.3 per cent rise in passenger vehicle (PV) sales in October 2017, the second-largest PV player posted a 0.8 per cent dip in its wholesale figures. 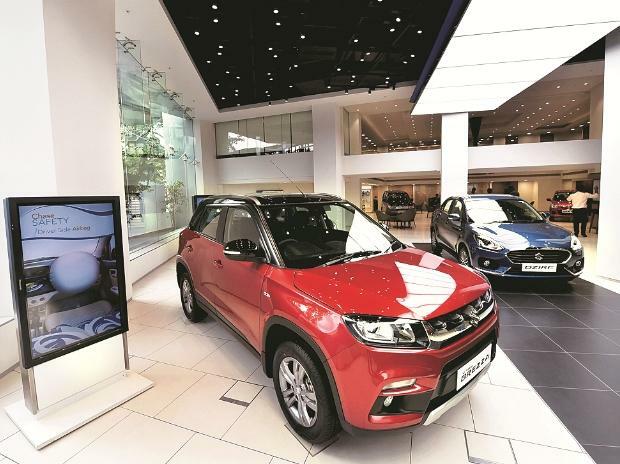 Mahindra and Mahindra (M&M) and Honda Cars India saw sales move to negative territory, down five per cent and 8.5 per cent, respectively, year-on-year. Tata Motors, which had seen a 28 per cent PV growth in October 2016 caused by its new launches, recorded a flat October 2017. In comparison, Toyota’s PV sales have done well, growing 6.45 per cent on the back of new limited editions Etios Cross X-Edition and Fortuner TRD Sportivo. The biggest loser was US firm Ford India, with sales dipping 44 per cent. October 2016, the base month in this case, not only had two festivals but was also defined by the lifting of diesel ban in Delhi-National Capital Region and the Seventh Pay Commission payouts, all boosting consumer sentiment. Subrata Ray, senior group vice-president of ICRA, pointed out that many original equipment manufacturers (OEMs) had stocked up in September anticipating festive demand. "Hence, October wholesale numbers are a little muted. We have to see the combined performance of September and October to get a holistic picture," Ray said. A case in point is Hyundai Motor India. Its director, sales and marketing, Rakesh Srivastava, said, "Hyundai did its highest retail of over 50,000 units in a festival month, with a wholesale of 49,588 units." September 2017 PV sales stood at 309,955 units, up 11.3 per cent year-over-year. Estimates peg October 2017 numbers at 275,000-280,000 units, almost flat compared to 280,677 units in October 2016. MSIL saw demand for its popular models Alto and Wagon R (mini segment) fall 4.2 per cent year-on-year while the compact segment (Swift, Ritz, Celerio, Ignis, Baleno, Dzire, Tour S) saw a 24.7 per cent jump in the same month. But the main growth driver for MSIL has been the utility vehicle (UV) segment clocking 29.8 per cent growth in October and 34.2 per cent growth during the April-October period. Tata Motors failed to ride on the demand for its new SUV Nexon, posting a one per cent year-over-year rise in PV sales for October 2017. Two-wheeler sales for the month of October witnessed single-digit decline at major companies such as Honda Motorcycle and Scooters India (HMSI) and TVS Motor Company. HMSI posted a fall of seven per cent. The company sold 437,531 units in the domestic market in the month under review compared to 470,358 units in the same month last year. Sales of TVS Motor, another major motorcycle maker, were almost flat at 270,372 units compared with 272,229 units last year. However, sales of Royal Enfield (RE) and Suzuki Motorcycle witnessed double-digit uptick. RE sold 68,014 units in October this year compared with 58,379 units in the same month last year, an increase of 16.5 per cent. Suzuki Motorcycle recorded a 26 per cent increase in volumes. The company sold 46,048 units in October this year compared with 36,519 units in the same period last year. That said, sales numbers of two major motorcycle makers, Hero Motocorp and Bajaj Auto, have not been declared.